The Wellington writer and critic, Simon Sweetman, recently asked his readers a couple of questions that inadvertently led to my recalling some scenes from the past. He asked if we’d ever seen a great busker. And he asked if we’d ever known anyone decent who went by the name of Travis. 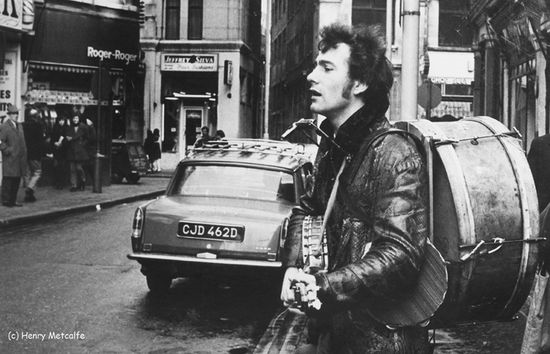 In 1968, I was living in London and becoming hip. Not cool, you understand, but hip. Mods had come and gone; Psychedelia, Hippiedom and Timothy Leary were the thing. Except I could only embrace some of it. I dug the counter-culture stuff, some occasional weed and most of the West Coast Music (Specifically not The Beach Boys though, whose very name brings on horrific psychosomatic symptoms if spoken, written or seen. Imagine what it cost me to print it here) but the residual mod in me demanded some attention to sartorial sufficiency. So here I am in a longish queue outside the Carlton Theatre in the Haymarket. I’m waiting to get in to see Lindsay Anderson’s ‘If’. Grey leather shoes with patterned toe caps, by Raoul; sharply creased, black mohair trousers and a tailored, black leather jacket with a sewn-in half belt. My concessions to the zeitgeist are a button-down paisley shirt and a conservative afro. The Gauloises cigarettes are situated precisely halfway between hip and cool. And here’s Don Partridge, singing while we wait. Known as ‘The King of the Buskers’, he’s a familiar sight around the pubs, clubs and theatres of the West End and Soho. He sings some Dylan and his own ‘Rosie’ which he’s recorded and been on the tele with. It’s a pleasant, early summer evening and we’re pleased to have Don entertain us while we wait. The shrewdly chosen pretty young woman takes the hat round and I add some coins to the many notes. Don’s doing okay thanks. The movie ‘If‘ is pure, anarchic counter-culture. 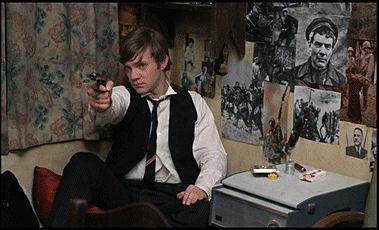 It marked Malcolm McDowell’s debut – in the role of Mick Travis (Yes, a tenuous connection, I know. But sometimes any idea is a good idea) – a role he was to reprise in two further films for Anderson; ‘O Lucky Man’ and ‘Britannia Hospital’. The structure and surreal nature of the film are much influenced by Jean Vigo’s ‘Zéro de conduit‘ (1933) but the plot of a student revolution, led by Travis, in an English Public School is an expression of Anderson’s belief that the British cinema needed to put aside its fixation with class and be more representative of the broader community. We discussed that in the pub later and I managed to upset a few friends with an observation that Anderson was perfectly placed to attack privilege in that way, having been educated at Cheltenham and Oxford. What neither I nor my friends properly realised at that time though, was that I was about to resolve the vexed choice between cool and hip by moving into the more considered role of rugged left-wing intellectual. Already my frequent use of irony, a newly grown beard and the recent acquisition of a houndstooth flat cap were pointing me toward a classless society and women called Cordelia and Vanessa. This entry was posted in Bio, Film, Music and tagged Don Partridge, Lindsay Anderson, Timothy Leary. Bookmark the permalink.